Looking through a pile of old portraits, I came across this one of Molly the Bichon Frise. She was a charming little dog who loved her tennis ball, so of course it had to be included in the portrait. She lived in a house with green shag carpet, a perfect backdrop for her snowy white coat. 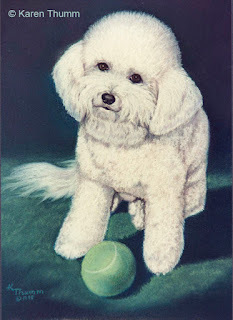 When I delivered the portrait, her owner seemed a bit underwhelmed (never a good sign) and sure enough, a day or two later she called to say that the portrait was not quite right; it just didn't look like Molly. I dutifully retrieved the portrait and examined the Reference Photo closely, and to my embarrassment realized that I had gotten Molly's head too narrow and the ears not right. Making corrections on a pastel portrait is fairly easy, and in no time "Molly" was looking like her real self. This time the client's enthusiasm was more genuine when I delivered the corrected portrait, and she has since told me how much she loves it. Sometimes one can get too close to a work of art and fail to see the flaws. I have learned to avoid this by standing back often from the easel, checking it frequently against the reference photo and looking at the work in a mirror where mistakes are more obvious. No artist, however accomplished, is immune from this myopia, so I've learned to be aware and to not flog myself when it happens.